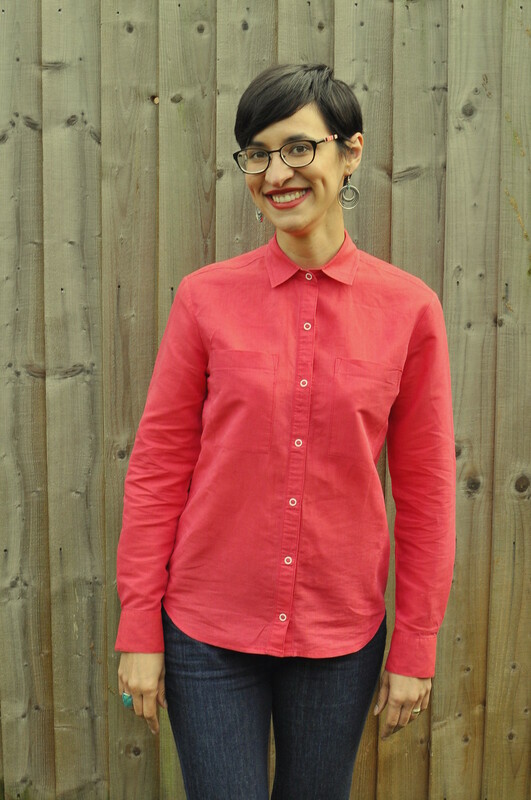 Earlier this year, I was leafing through my Boden catalogue and I fell in love with one of their linen shirts. It was a raspberry pink colour with *I think* white ring poppers, but it could've been white buttons. It was very loose fitting and looked really comfortable. I almost bought it, but with a price tag of over 50 quid, I left it alone. A few days later, I went into my local fabric shop and found a linen and cotton blend in the same colour at only £6/m. I bought it. Then, I decided to bite the bullet, buy the Archer pattern and make myself a Boden rip off for less than half the price. The only other shirt I'd tried making before was the Sewaholic Granville. It was not a 100% success story but I don't give up easily. This time around, it turned out *exactly* as I had envisioned it. Isn't it great when that happens? A Boden rip off for around 20 quid. Yes, please! The fit is spot on. I cut a size 2 and didn't make any changes. I love the way it fits me: lots of room to move without looking excessively baggy. I chose version A, with the traditional shirt back but I went for the angled cuffs of version B. The instructions and some of the markings could've been a little clearer at times but they were generally good enough. I really enjoyed the process of making this shirt. Despite putting pressure on myself to get it finished before we went away for the weekend, I didn't sew this up particularly quickly. I cut it up one evening and started making it up in bursts of free time over the next couple of days. The yoke is done using the burrito method which I'd done on my Granville. The side and arm seams are overlocked and all other seams are sort of self contained, thanks to the construction techniques used. My topstitching is also pretty good all around. Even my pockets look great. The fabric is amazing as well. 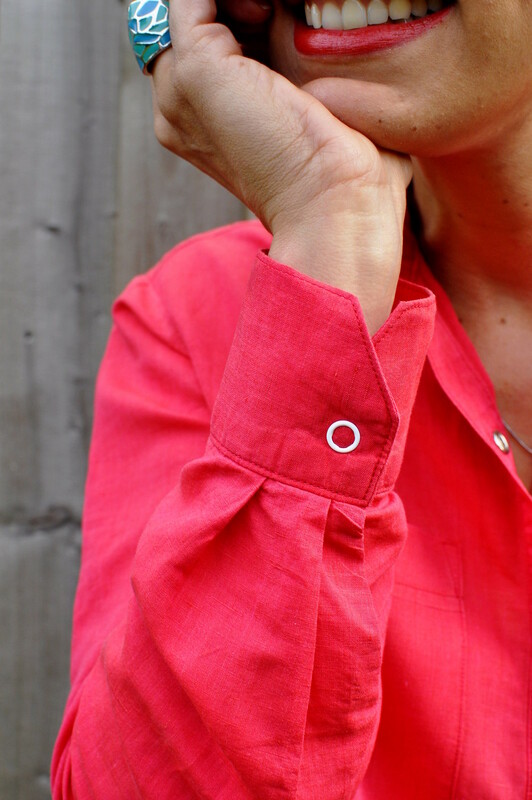 As I said, it's a cotton and linen blend and it's oh, so breathable! It creases quite easily but that doesn't bother me. 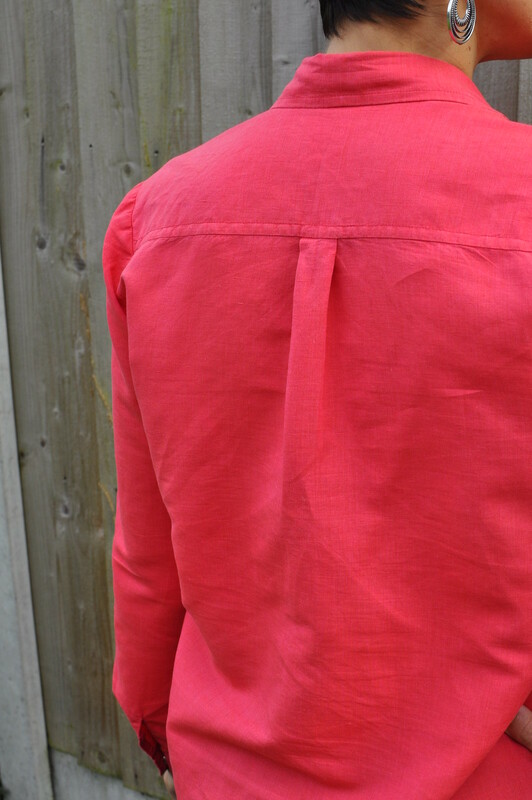 I like the look of creased linen. It's very lightweight, too, so it'll be comfortable to wear even if summer decides to show up properly. I decided to have a go at installing snap fasteners this time around. I must admit, all these people that have been saying how much fun they are? LIARS!!! I ruined about 3 before I was confident enough to have a go on my precious shirt. And before I was done I actually ended up hammering my finger instead of the setting tool. Not good. However, I do appreciate that this was my first time and my next go will probably be easier. Some people choose poppers over button holes any day and I'm not sure I'll ever be one of those. I'm mostly proud of my collar. 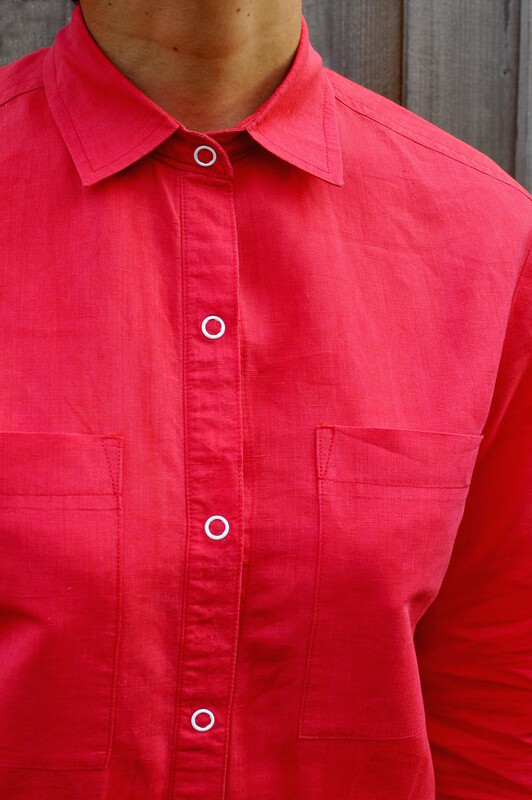 I've never been able to make a collar stand that would a) overlap properly or b) fit a button and/or buttonhole. This one, though, because the collar seems to be a little shorter than the others I've made, is perfect. Until last week, my Rosa dress was the item I was most proud of from everything I've ever made. This Archer has taken over the top spot now. I'm very happy with how it turned out, the finish of it is very good and I'm highly motivated to get more shirts under my belt.